The views of Super Play are gospel, or at least they were in my youth. When they got excited about a game I would get excited about a game. More often than not this enthusiasm would be targeted at an obscure JRPG that I had no hope of ever importing but every now and then they would fall in love with a game that had a vague chance of a domestic release. “By far the best game of its type on the snes. There's not been a title to touch this for a long while when it comes to generating interest around here, that's for sure” they exclaimed in one issue adding “You can't afford to miss an example as polished as this, one of the finest games ever”. But it wasn’t just Super Play, even the notoriously harsh Edge magazine gave this game a 9 out of 10 rating, stating that its "one of the best games currently available for any home system.” But what was this magical game that seduced them all? 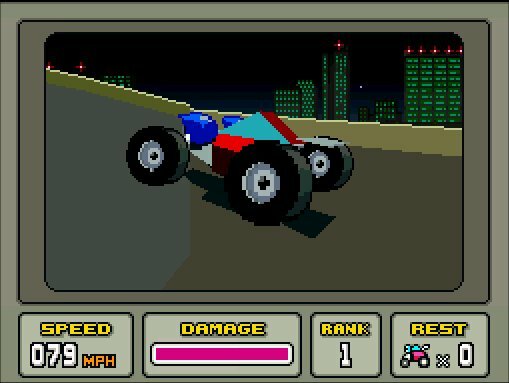 A racing game from the makers of Star Wing, they knew it as Wild Tracks but the west would come to know it as Stunt Race FX. playful names. 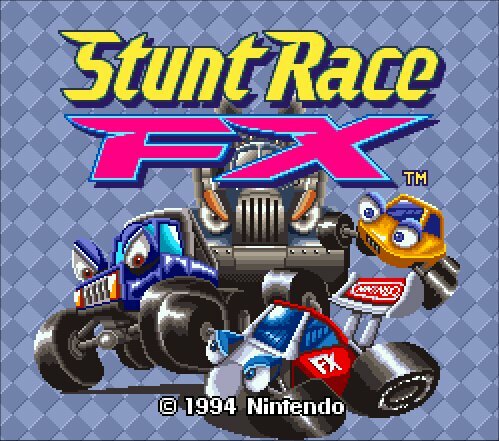 As the name implied, and much like its space shooting stable mate, Stunt Race FX is one of the few Super FX powered games. 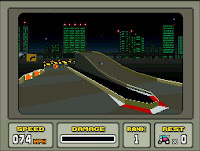 This polygon look may have drawn comparisons with the Mega Drive’s Virtua Racing, but in reality no two racing games could possibly be further apart. Most of Stunt Race FX may be geared around grand prix seasons, made up of four different races, however despite being track based the game cares more for your time than finishing rank. 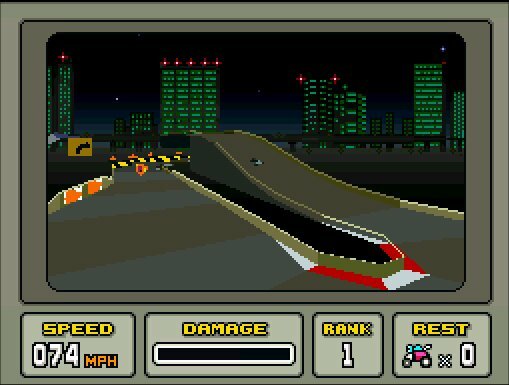 Much like an arcade style racing game (like Out Run) an onscreen counter sets a target for when you must reach the next check point. Failure to do so regardless of position means elimination from the race, you’re not really racing the other cars apart from the fact that finishing fourth results in a loss of life. It's a odd set up that makes the other cars feel less like opponents and more like pace makers and a top podium finish is largely irrelevant. Lap times in Stunt Race FX are your main focus. Success is archived by optimal use of a boost, and minimising car damage. Any remaining time is carried onto the next race, so essentially the only way to win the title (by crossing the line on the last race before the timer runs out) is by performing well in all races. The result is a racing game that ends up feeling frantic, tense and enjoyable right until you cross the line. It avoids that trap that affects other similar games where you end up just going through the motions in final races, as you have such a point lead that even coming last will result in the title. 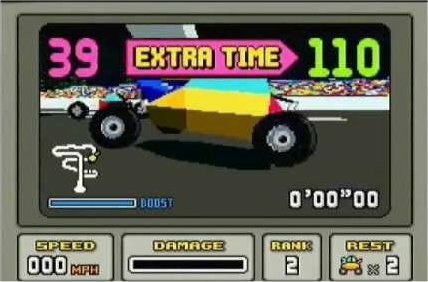 With only three other possible cars on screen, a point based racing league simply wouldn’t have worked, necessity forced a different approach. As with so many things in Stunt Race FX design was dictated by what was possible with technology. Cleverly, much like the number of cars in a race the cartoonish fracturing chaises also serve to disguise the technical limitations. As they race around the tracks, any loss in model cohesion feels designed rather than a fault in the game. 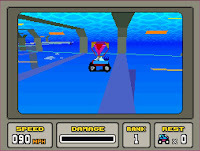 Likewise the games lack of speed seems appropriate for the playful and clumsier cars with ludicrous proportions. The fact this game was never going for a realistic aesthetic certainly mean it hasn’t aged as badly as some over polygonal racing games of the era. There are in total twelve circuits, for you to drive around each with a generic theme like an aquatic (complete with a floating track and underwater tunnels), night city skytrack, lush forest, boulder mountains. There's a range of terrain and you will find yourself racing during the day, at night and during sunset. However all of them use height to great effect, presumably to emphasize the abilities of the FX chip over a Mode 7 based racing game. 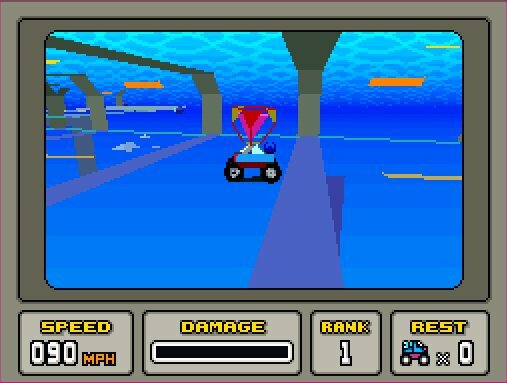 Indeed it’s only after playing Stunt Race FX that you realise that Super Mario Kart, Exhaust Heat and F Zero, all have a completely flat tracks. slightly more detailed environments, with the first use of polygon texture mapping in a SNES game. However this step up in visual flare comes at a cost; significantly lowered frame-rate and limiting the player's view. In fact there is only about 60% of the screen devoted to actual gameplay. Ambition had pushed what was possible to the limit, and at times the cracks began to show, particularly in two player mode which is rather crippled compared to the single player. 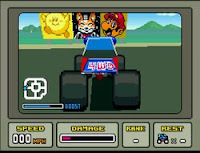 Technical limitations meant that with a friend the view of the race shrinks to a quarter of the screen, the already low frame rate drops further. From a gameplay point of view there's also compromises as you're limited to four simplified tracks that have much less detail. There may be a neat trick where leaving the second controller alone for some seconds prompts the computer to take over, but even with company (be it AI or human) the actual interaction with each other is minimal. Stunt Race FX is essentially a one player game because technology forces it to be essentially a one player game. That’s not to say this is a bad thing, indeed I may even think the unimaginable, that when played alone this racing game exceeds even Mario Kart. With less emphasis on beating the competition, the focus shifts to player skill making it a much less frustrating experience. Unlike Mario Kart, you never feel cheated out of a win because a computer opponent has somehow caught up despite being half a lap behind. It is a short game though and if considered only a one player game you can finish it in a dozen hours. The 17 total course may be varied but once you have unlocked and beaten them all I doubt you will spend too long replaying them to beat a lap time. Mario Kart is probably more fondly remembered because of its incredible two player modes, people just spent more time playing it than this game. For example, I vividly remember when I got Stunt Race FX, it was in Lakeside shopping centre and I had saved all year to buy it from Electronic Boutique – it was £40 and I bought it as soon as we arrived there and spent the rest of the day looking at the box. I can remember the following Sunday playing it, being wowed by the graphics, and really enjoying the one player mode. The problem is that’s all I remember; I don’t think I played it much after that. I can however recall hundreds of hours playing Mario Kart with my brother – literally hundreds of hours. 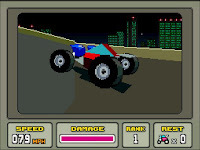 So when you ask the average gamer, what was their favourite racing game on the SNES, how many will remember the few hours they spent with polygon cartoon cars compared to the days they spent with go-karting plumbers. So a better solo game than Mario Kart, that is destined to be forgotten in the mists of time. This is a shame as the game deserves more, if for nothing else it should be recognised as a game that set the bench mark for polygon racers to live up to. I bought this on eBay as bizarrely it never sells on there for more than £10 even mint CIB. It does look dated, considering its age but not as badly as you’d imagine. The deliberately, blocky colourful, ridiculous design of the cars has meant that it has kept its own charm even during these lavish 3D times. I appreciate your comment but please don't swear.